Otherwise known as the Treaty of Peace with Japan, The Treaty of San Francisco was signed on September 8, 1951 by 48 allied nations, officially ending World War II and reestablishing Japanese sovereignty. Signed at the War Memorial Opera House in San Francisco the treaty went into effect on April 28, 1952. The Allied Powers recognized the full sovereignty of Japan. Japan renounced all rights and claims on various countries and islands including Korea, Taiwan, Hong Kong, and Antarctica. All occupation forces were to be withdrawn from Japan (except as outlined under new treaties with and agreed upon by Japan). Japan agreed to enter into negotiations on repayment of reparations to the Allied Powers for damage and suffering it caused during the war. Japan agreed to accept the judgments of the International Military Tribunal for the Far East and other Allied War Crime Courts both within and outside Japan. The Bilateral Security Treaty between the United States of America and Japan was signed on the same day, and outlined the United States’ plans for maintaining a military presence in Japan to protect it from threats from other nations as Japan was officially disarmed by the Treaty of San Francisco. This additional treaty set the stage for the continued use of Japan as a staging area for US military operations in the Far East region. As the Korean War was still taking place it was viewed as critical that Japan be kept as a base for US military forces. The combined action of these two treaties inevitably led to strong opposition by the Soviet Union, who along with Poland and Czechoslovakia refused to sign the treaty. During the treaty-signing conference, the Soviet Union delegation led by Andrei Gromyko outlined significant objections including the assertion that the treaty did not provide any guarantees against the rise of Japanese militarism. It was not until October 19, 1956, that Japan and the Soviet Union signed a Joint Declaration ending the war between the two nations and reestablishing diplomatic relations. Questions resulting from the legitimacy of existing governments and the state of war between North and South Korea prevented the Republic of China in Taiwan, the People’s Republic of China, and North and South Korea from attending the conference. Historical events never happen in isolation, even though we do tend to study them that way. What lasting effects of WWI led to WWII? What lasting effects of WWII led to the Cold War? 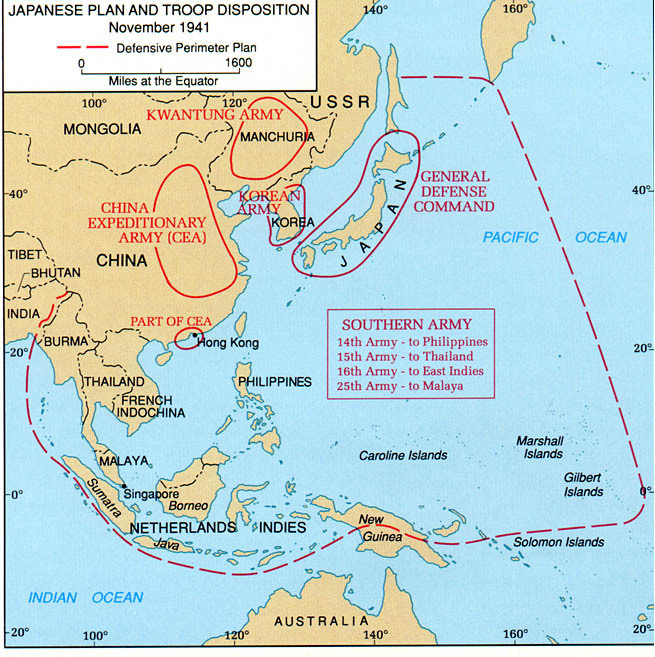 Review the Japanese plan for taking and holding the Pacific. Make a chart showing the countries and islands the Japanese lost as a result of the Treaty of San Francisco and their disposition. Timeline from the U.S. Holocaust Museum. Map showing the Japanese defensive perimeter at that time. Note the countries they occupied. of the Treaty of Peace with Japan. Interactive map from National Geographic. Create your own maps of the countries Japan held. Another one of our units about the President who signed the peace treaty with Japan. Map showing the extent of the Japanese perimeter during the war (shown with red dotted line). Very nice maps of Asia are included in this free KnowledgeQuest download. Free printables at HomeschoolHelperOnline include pages for President Roosevelt and President Truman.